Lisa Marie Presley talked about why she and Michael Jackson split on the Oprah Winfrey show (originally aired in October 2010). Lisa claimed that Michael pushed her away, built a wall of sycophants around himself and she had no place in his life. She also that he was a very manipulative person. This is true. It can be seen on his hands. But at the same time, he is likely to have been very vulnerable, very sensitive and a lost soul. It seemed strange this his ex-wife had not seen this. She was married to him, she was supposed to know him better than anyone else. I could not help but think that the whole picture was not being given. Clear photographs of Lisa Marie Presley’s hands were unavailable but one can see that she has a bent Jupiter (index) finger, a low-set Mercury (little) finger, developed mounts and very supple thumb with a slightly thick, long will phalange. This shows impulsivity, stubbornness, and a difficulty with relationships and also a manipulative nature. She was probably as manipulative as Michael Jackson. The broad palm and square-tipped fingers and the low-set thumb are all good sign, showing a compassionate and broad-minded personality but human beings are complex creatures and are often a mix of conflicting personality traits. Unfortunately, I had to rely on just a few photographs of her hand so it is difficult to say anything about her with the accuracy that I would like. Michael’s hands show him to be stubborn, unreasonable at times, and very independent, so much so that he would not allow himself to be controlled, not even by those he loved. He was extraordinarily sensitive. Perhaps Lisa Marie did not understand him. If she had believed that she could control him, it would have been a big mistake on her part. Perhaps her impulsivity is what led her into marriage with him. Related Reading: Michael Jackson's hands reveal his strengths and weaknesses or The hand analysis of music star Maddona and other celebs like Beyoncé Knowles or Rihanna or Oprah Winfrey. This is also evident on a more basic level - People who are good don't accuse others, that too after the other person has died. I agree with you DI. I saw that interview and my instinct told me that something didn't ring true. A look at Lisa Marie's finger shape (Mercury and Jupiter fingers) told me a tale. This is ofcourse not an analysis of her personality, just one characteristic and that is why I have been kind to her, precisely because I could not see the rest of her hand. I think your observations are very astute and accurate. I would like to know if you can read body language as well. I have noticed in all of Lisa Marie's interviews, her eyes shift and she rarely looks at her interview. She also touches her nose and turns away, wipes at her eyes, and laughs at inappropriate times. To me this is a sign of dishonesty, but I wonder if you have any further insights. Anonymous, I know body language as much as the next person and am not an expert. I too noticed the things you mentioned. In fact I also felt that she manages to keep her face quite expressionless as if she has learnt to do that with practice. One cannot guess what is going on in her mind! I agree with your analysis and in fact found that very quality you mentioned marked on her hand, but did not mention it because I could not see the rest of her hand. I too would be interested in an expert reading Lisa's body laungage. Her eyes shift and she does touch her nose alot. I think this analysis is very acurate. I agree with this, I always felt like she was projecting her own failures onto Michael. Michael himself said (to Flo Anthony) that she became very manipulative (such as lying about wanting to have his children so he would marry her) and controlling and that is why he left. I see it in her behavior, in her interviews (esp. the last 2010 Oprah one). It was funny how she talked about him being so manipulative, yet in the same interview, talks about filing for divorce in hopes that he would come back to her. This, among other things...yeah, manipulative. Hi NIta, I'm just now reading your site and there's a wealth of information and guidance in it. However, I wish you could be a bit more educative (for want of a better word), maybe revealing(?) about why you come to certain conclusions. For example, here, you say that LMP's hands are the ones showing a manipulative nature because of her Jupiter and Mercury fingers (i.e., in two places in her hand). However, you don't tell us exactly what is it about these fingers that tells you that she is manipulative. Does that make sense? If you could please be a bit more patient with us palmistry newbies and show/tell a little more about what causes what or what exactly reveals what, I would be very grateful as I am learning a lot already from your blog. Thanks so very much for a great site! Hi Indranee, I am hesitant to say what it is exactly for a very simple reason. I reach my conclusions based on several aspects of the hand, because every sign needs to be seen in context, however there is always a major feature of the hand which points to a certain conclusion (which can be modified or enhanced by other features). If I mention one particular feature, it will mislead people. 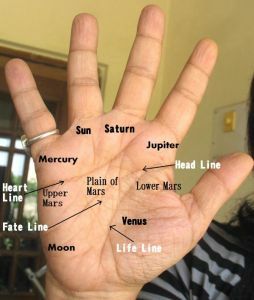 Learning palmistry is not as easy as some books or websites make it sound. It is a study of the whole hand. Another thing, to write it all here, well, I will be giving away some of what I have learnt from my own experience, and I am writing a book on it, based on my own research. I cannot tell it here. If you are interested in becoming a good hand reader, I can tell you the way I learnt. I read everything I could of course, but the main thing is experience. Start with reading the hands of those whom you know very well, and try and co relate your knowledge with what you see on the hand.